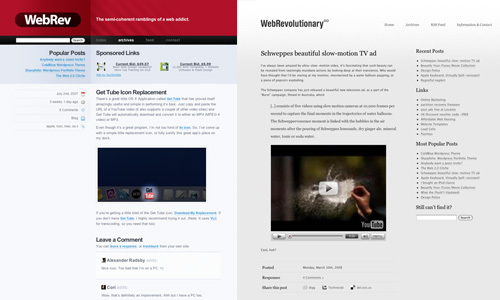 As previously mentioned, I’ve just switched over to WebRevolutionary’s new design. While the old design was quite well received by most, I felt that it lacked the versatility I needed, had fairly poor typography, and, well, I was getting a little bored. To some, the new design (unofficially named “Greyscale”) may not look quite as flashy, or as colourful as the previous incarnation, but that exactly what I was aiming for. The new theme is geared towards being clean, legible, well layed out, wider and more flexible. I enjoyed diving straight into the markup with this design, skipping the Photoshop mockup process entirely. This means that I was able to give more focus to the functionality and practicality of the blog, rather than it’s digs. I’m sure I’ll be tweaking this thing around for weeks, so if you find any gaping holes or oversights please get in touch with me. In this new era for WebRevolutionary, I’m going to focus on making the posts colourful enough to balance out the… greyness of the layout, both in the literal and metaphorical sense. As for the old red/black/blue theme, I’m about to start cleaning it up for public release. Either one individual who’s looking for a solid, unique theme for their blog, or, failing that a free download for the world to ingest. If you’d like to discuss the prospect of making the theme yours, again, just get in touch. Woot! I’m really glad you’ve relaunched the site Matt. I love the new simplistic design. It suits your site very well. I couldn’t agree with your design decision even more. I’m personally a huge fan of Minimalism and appreciate the white space that you’ve opted for. Sometimes, we get so caught up in trying to incorporate so many design elements, that it can take away from the purpose of the site itself, which is ultimately the content. Great job! Wow, I’m loving the new theme. It looks great. Great Design, matt! I love the simplicity. The smiley is from http://stats.wordpress.com/g.gif. don’t forget that the transparency of png’s doesn’t work in IE6 – the images will all reset to a dark grey background (header text, quotation marks in comments, and possible the “advertise with webrev” area). One thing you might consider is increasing the font point a bit (at least on 1400×900 it’s barely legible) other than that it’s a great design, kudos to you! Hi! When do you release the Greyscale theme? Thanks! I would really love to have greyscale, or even the css that goes along with it…just gorgeous. It is coming within a week!